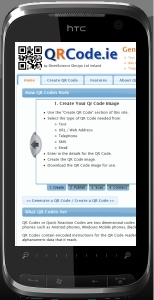 Use the "Create QR Code" section of this site. Enter in the details for the QR Code. Create the QR Code image. Download the QR Code image for your own use. 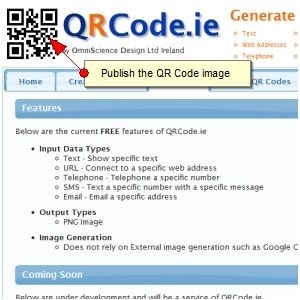 Create more QR Codes for your own use. People can scan your QR Code image with their mobile phone. Many mobile phones including SmartPhones come with QR Code Readers already installed. 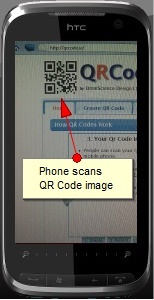 Now the person can connect and perform the required action you specified in the Creation of the QR Code. Text : they are shown the Text specified in the QR Code. Web Address / URL : their phone can connect to the website specified. Telephone Number : their phone can direct dial the number specified. SMS : they will be prompted to send an SMS to the Number specified with the Message specifiede. Email Address : they will be prompted to send an email to the Email Address specified. QR Codes or Quick Reaction Codes are two dimensional codes that can be scanned by applications on various mobile phones such as Android phones, Windows Mobile phones, Blackberry phones and iPhones. QR Codes contain encoded instructions for the QR Code reader to instruct it to perform an action based on the alphanumeric data that it reads. Essentially it can provide physical world hyperlinks from physical world objects to both offline data and online services, websites and data - taking away the need for remembering or typing web addresses, phone numbers, contact details into your phone etc. Life just gets easier! QR Codes can appear in websites, magazines, flyers, billboards, business cards and more. You can create or generate QR Codes through this website and below are some examples where QR Codes can be used, click the QR Image to enlarge for reading / scanning. Click the QR Code images below for examples. Think that a customer could see your QR Code on an advertisement or on a business card/brochure etc and simply scan the code and quickly connect to your website or even give you a call. To add to this QR Codes can be tracked and can give statistics on which QR Codes were scanned, when they were scanned, how often they were scanned and also by customising the QR Code you can track where it was scanned. There are a range of mobile phone applications available for download. Please use the Steps below to Create a QR Code. This QR Code image can then be saved and used as you wish. Step 1 : Select which you would like to Create a QR Code image for below. Step 2 : Click Generate below. 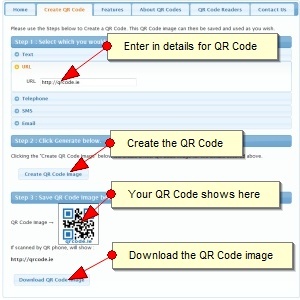 Clicking the "Create QR Code Image" below will create a new QR Code image for the details entered above. Step 3 : Save QR Code Image below.